Mrs. Frances E. Heck, age 90 formerly of 1057 Courtland Drive, Sanford, NC passed on Tuesday, January 29, 2019 at 1227 Wolf Swamp Road, Jacksonville, NC. Mrs. Frances Nancy Edwards Heck was born to the late Etta Mae Edwards and the late Albert Johnson on February 3, 1928. She was raised by her loving grandparents, the late John and Lizzie Edwards. On January 29, 2019 she exchanged life on earth for one of eternal peace and rest at the age of 90 years old. She was married to the late George Alton Heck and to this union five children were born. 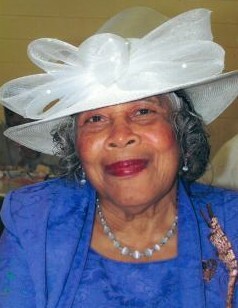 She was a loyal member of Wall Street Baptist Church for many years. While there she was an active member of the senior choir, missionary circle and taught vacation bible school when her children were young. Now known as First Calvary Baptist Church, she still remained a loyal and faithful member. She became a deaconess and worked on many fundraisers for the church including one of her favorites, THE RAINBOW TEA. She was a very loving and kind wife, mother, grandmother, sister, aunt, cousin and friend. She had a passion for helping others. After caring for her husband for ten years, she went back to school and received her CNA Certificate. She lovingly cared for church members and friends who were ill. She really did love gardening. She worked at W. Koury Company, Golden Poultry and Sanford Tobacco Company for many years. Frances was preceded in death by her husband, George Alton Heck; two sons, James Alton Heck and David Alexander Heck; her mother, Etta Mae Edwards and father, Albert Johnson; sisters, Pauline McGilberry, Eunice McLean, Elon Graham, Josie Edwards, Cora Clegg, and Sophia Battle; brothers, John Edwards and Williams Edwards; grandparents, John and Lizzie Edwards; grandchildren, Stephen Johnson, Tina Johnson and Wendy Heck; great grandson, Aaron Heck. She leaves to cherish her memories three daughters, Frances Johnson and Etta Heck of Sanford, NC and Patricia Singletary (Ellis) of Jacksonville, NC; daughter-in-law, Barbara Heck of Sanford, NC; two sisters-in-law, Elnora Heck and Corrine Edwards of Sanford, NC; thirteen grandchildren; forty seven great grandchildren; fifteen great great grandchildren; one aunt, Martha King of Clinton, NC; thirty two cousins; two dear friends, Mrs. Louise Blue and Mr. Pedro Laureano and a host of nieces, nephews, other relatives and friends.